Gift Certificates make the perfect gift any time of year … and what’s better than the gift of learning! Our gift certificates can be used to register for our STEM courses, team registrations, or birthday parties and can be printed out or sent electronically to your recipient. To make a purchase, please complete the form below. 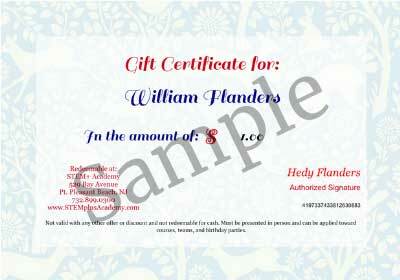 An email will be sent to you with a pdf attachment of your Gift Certificate which you can print out or email.